Harry Potter and the Philosopher's Stone. Harry Potter and the Chamber of Secrets. Harry Potter and the Prisoner of Azkaban. Harry Potter and the Goblet of Fire. Harry Potter and the Order of the Phoenix. Harry Potter and the Half-Blood Prince. Harry Potter and the Deathly Hallows. 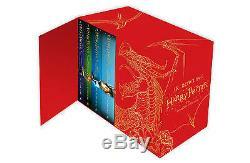 A beautiful boxed set containing all seven Harry Potter novels in hardback. These new editions of the classic and internationally bestselling, multi-award-winning series feature instantly pick-up-able new jackets by Jonny Duddle, with huge child appeal, to bring Harry Potter to the next generation of readers. It's time to PASS THE MAGIC ON. Turning the envelope over, his hand trembling, Harry saw a purple wax seal bearing a coat of arms; a lion, an eagle, a badger and a snake surrounding a large letter'H'. Harry Potter has never even heard of Hogwarts when the letters start dropping on the doormat at number four, Privet Drive. Addressed in green ink on yellowish parchment with a purple seal, they are swiftly confiscated by his grisly aunt and uncle. Then, on Harry's eleventh birthday, a great beetle-eyed giant of a man called Rubeus Hagrid bursts in with some astonishing news: Harry Potter is a wizard, and he has a place at Hogwarts School of Witchcraft and Wizardry. But perhaps most terrifying of all the dementors patrolling the school grounds, with their soul-sucking kiss.. There will be three tasks, spaced throughout the school year, and they will test the champions in many different ways... Their magical prowess - their daring - their powers of deduction - and, of course, their ability to cope with danger. The Triwizard Tournament is to be held at Hogwarts. Only wizards who are over seventeen are allowed to enter - but that doesn't stop Harry dreaming that he will win the competition. Then at Hallowe'en, when the Goblet of Fire makes its selection, Harry is amazed to find his name is one of those that the magical cup picks out. He will face death-defying tasks, dragons and Dark wizards, but with the help of his best friends, Ron and Hermoine, he might just make it through - ALIVE! You are sharing the Dark Lord's thoughts and emotions. The Headmaster thinks it inadvisable for this to continue. He wishes me to teach you how to close your mind to the Dark Lord. Dark times have come to Hogwarts. After the Dementors' attack on his cousin Dudley, Harry Potter knows that Voldemort will stop at nothing to find him. There are many who deny the Dark Lord's return, but Harry is not alone: a secret order gathers at Grimmauld Place to fight against the Dark forces. Harry must allow Professor Snape to teach him how to protect himself from Voldemort's savage assaults on his mind. But they are growing stronger by the day and Harry is running out of time. There it was, hanging in the sky above the school: the blazing green skull with a serpent tongue, the mark Death Eaters left behind whenever they had entered a building... When Dumbledore arrives at Privet Drive one summer night to collect Harry Potter, his wand hand is blackened and shrivelled, but he does not reveal why. Secrets and suspicion are spreading through the wizarding world, and Hogwarts itself is not safe. Harry is convinced that Malfoy bears the dark mark: there is a Death Eater amongst them. Harry will need powerful magic and true friends as he explores voldemort's darkest secrets, and Dumbledore prepares him to face his destiny..
Give me Harry Potter,' said Voldemort's voice,'and none shall be harmed. Give me Harry Potter, and I shall leave the school untouched. Give me Harry Potter, and you will be rewarded. As he climbs into the sidecar of Hagrid's motorbike and takes to the skies, leaving Privet Drive for the last time, Harry Potter knows that Lord Voldemort and the Death Eaters are not far behind. The protective charm that has kept Harry safe until now is broken, but he cannot keep hiding. The Dark Lord is breathing fear into everything Harry loves, and to stop him Harry will have to find and destroy theremainingHorcreuxes. The final battle must begin - Harry must stand and face his enemy.. Harry Potter The Complete Collection 7 Books Set Collection J. Additional items are also shown for the same item. How will I know when my order has been dispatched? How long will it take for me to get my order? What do I do if I have not received my order when expected? Courier Please check your tracking details and contact the courier to trace your parcel. Please note that couriers can deliver up until 7pm. What if there is an item missing or damaged? If you are unavailable, the courier should leave a calling card and take the parcel back to your local depot. Alternatively, you can collect the parcel from your local depot. We do our best to ensure all of our customers enjoy a happy shopping experience with Lowplex however occasionally you may need to return an item. To return an item(s) firstly write a covering letter with your order reference number and return it with your invoice and goods to. Price Cut Books Ltd Unit 31 Vulcan House Business Centre Vulcan Road Leicester LE5 3EF United Kingdom. We would recommend that you return your items via tracked post. Some goods are non-returnable for hygiene reasons. Please note that this does not affect your statutory rights. However you will be responsible for the cost of returning the goods to us. The goods do not need to be in their original packaging however in a sellable condition, and at your own cost and risk. The item "Harry Potter The Complete Collection 7 Books Set Collection J. Rowling Red" is in sale since Monday, September 7, 2015. This item is in the category "Books\Children & Young Adults\Other Children & Young Adults". The seller is "lowplex-ware" and is located in Leicester. This item can be shipped worldwide.